Recently, a group of 35 Olympia bikers called the Garage Bar & Grill in Kitsap Way with a warning: they were en route to Bremerton and they weren’t leaving without a Bloody Mary. 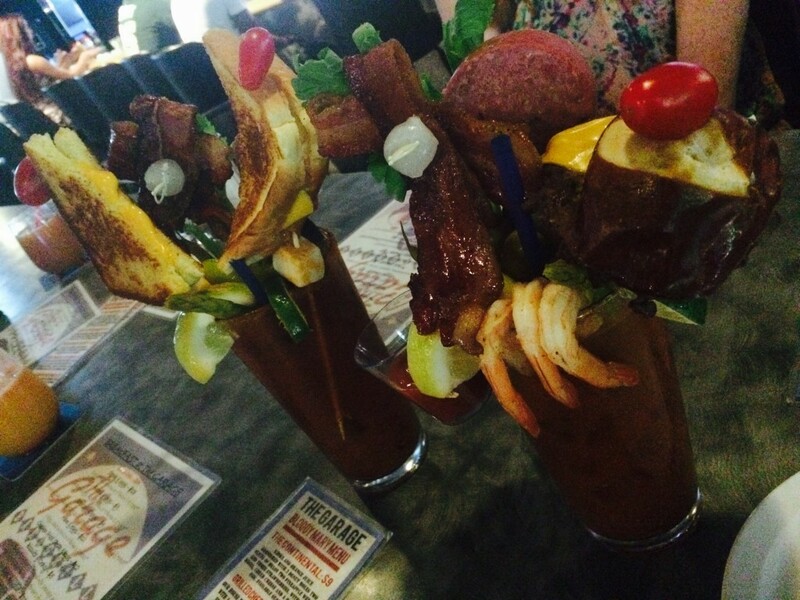 Not just any Bloody Mary, mind you. We’re talking about a freshly-made 22-ounce monster equipped with an entire buffet of bar food around its rim. The mere act of delivering it to one of The Garage’s bar stools is a showstopper. “Their faces light up and their phones come out,” said Annie Herinckx, The Garage’s manager and creator of the special line of drinks there. Far as I can tell, if you’ve not somehow heard about these behemoths from a friend or scrolled past a picture of one on Facebook, you’re the rarity. They sold more than 1,600 Bloody Marys in May alone. The buzz around the specialty menu is big, to include a write-up in Chilled Magazine, dedicated to those things served mixed. Personally, I found a lot to like in the Ultimate Bloody Mary ($13) which includes a slider, three shrimp and sweet candied bacon. Even more carnivore-inclined Seahawks fans will want to indulge the Beast Mode ($16), which comes with bacon, tater tots, chicken wings, a pepperoni straw and — what else? — a bag of skittles. The drinks range from the “basic” (still heavily garnished) at $7 all the way to the recently-debuted “Big Mother Mary,” a $40 pitcher equipped with every last accompaniment they have. Herinckx said the idea for the specialized line of drinks just came to her late one night. She had inspiration from Danny Mederios, a legendary Bremerton bartender who made scratch bloody mary’s at Romeo’s before his death four years ago. His picture still hangs in the bar. She also had help from the TV show “Bar Rescue,” she says. The drink is the integral part of a successful turnaround of the bar. Once better known for its place in the “Barmuda Triangle” DUI trap, Herinckx and bar owner Jack Johnson transformed it into The Garage in October 2012. With an emphasis on staff kindness to create a welcoming environment and having a nearly 24-hour kitchen — the place is only ever closed from 2 to 6 a.m. — Johnson and Herinckx have nearly quadrupled the business. The bar’s located at 6812 Kitsap Way. 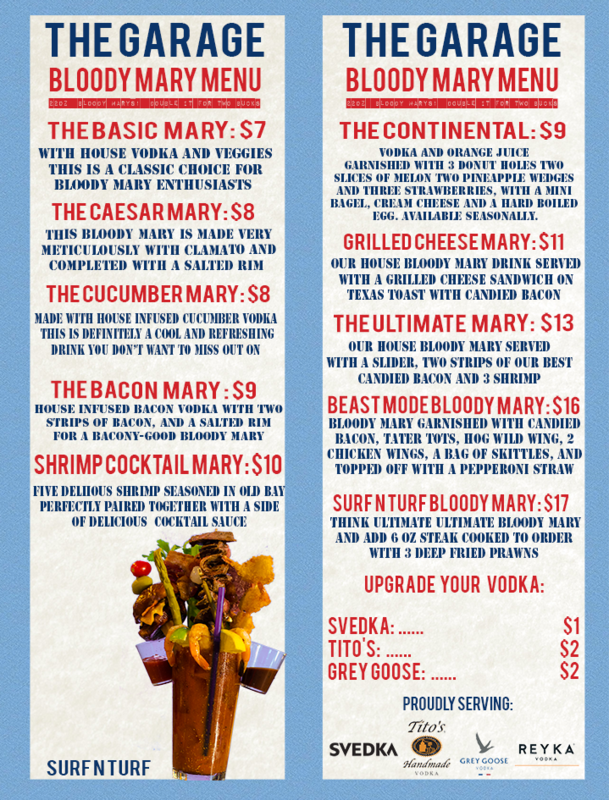 Their full Bloody Mary lineup is below. Josh, Loving your uniquely fresh look at Bremerton. Keep it up. Josh….great article….now I HAVE to go and try one! Many of the younger bartenders don’t know about the drinks we used to drink “back in the day”. Remember Harvey Wallbangers? Boilermakers? Fluffy Duck? Dirty Mother? Where have all the good drinks gone? We were out of the area for 12 years courtesy of the Navy, retired and moved back. The Garage is our go-to breakfast place. We have never been served a less than stellar meal and the staff are courteous and friendly. And very, very busy!